Coming Meetings of the NZHRCA - List at bottom of page 5. 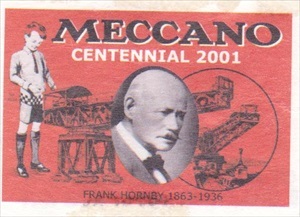 For the history of Hornby Trains made by Meccano Ltd go to the website of the Hornby Railway Collectors Association. Go to the links on page 5 of this site to find the HRCA website - then go to `History.Range`. Note - You may have to do a little scrolling to see complete pictures. Please note that we are unable to give estimates of values of old Hornby trains. As with all vintage items it all depends on what a buyer is prepared to pay. Sometimes a search through TradeMe can give an idea of items on offer. 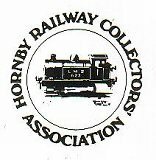 Affiliated with the Hornby Railway Collectors` Association (England). Our aim - Preserving the great old toy trains of the past, (all brands, not only Hornby )and having fun at the same time! 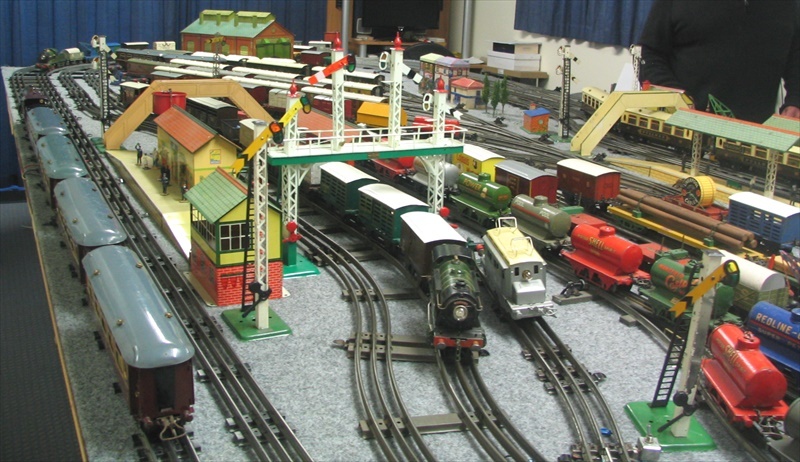 Meeting people with similar interests, and putting on displays to show the charm of these old toys to the modern world! Catering for the original Hornby trains, both 0 gauge and Dublo, made by Meccano Ltd. 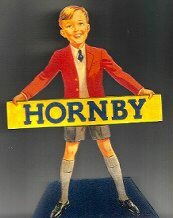 The first Hornby Trains were made in 1920, Dublo was introduced in 1937, Meccano Ltd stopped production in 1964. 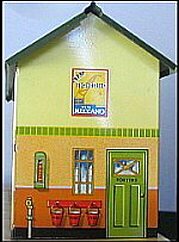 We also cater for some other toy trains, particularly those made 40 years or more ago - but we are flexible and modern reproductions in the old style are welcome too. 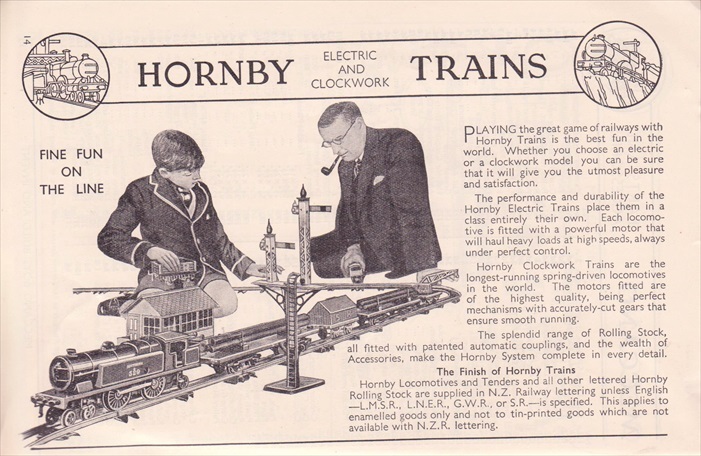 But this does not include the modern Hornby, which is a development of Triang Trains, and are not the descendants of the original Hornby that were made by Meccano Ltd.
At present there are five pages to this site. For these click on the icons at left. 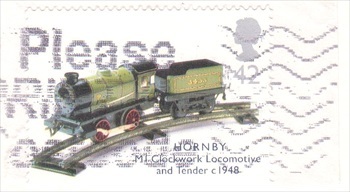 Postage stamp issued in the U.K. Shows a Hornby M1 locomotive. 1937 catalogue. Dad is home from the office and is playing trains with his son. Dad is still in his office clothes and may stay that way all evening, Good dads smoked pipes in those days. Son is also very tidy, complete with a tie. Things were a little more formal then,- after all someone might call! 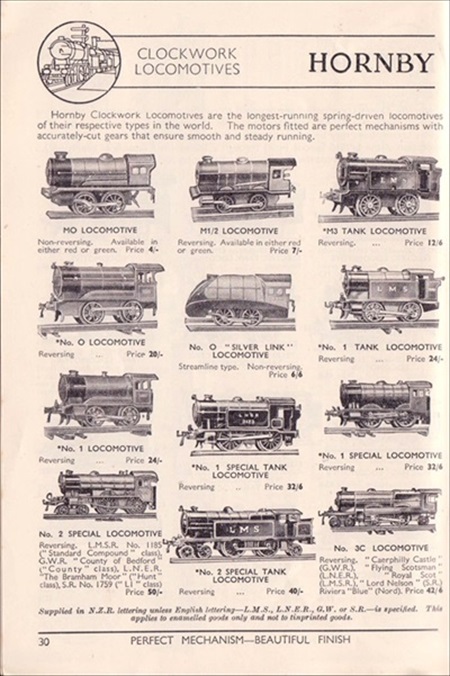 From 1937 Hornby & Meccano catalogue, Hornby clockwork locomotives. Prices are in New Zealand currency, Considerably more expensive that UK prices, almost twice as much in some cases. Probably wages were not greatly different. 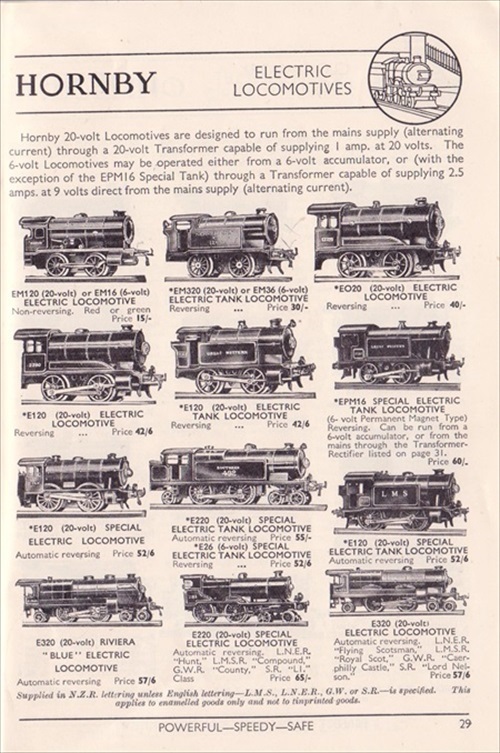 Hornby electric powered locomotives shown in 1937 New Zealand catalogue. The above two pictures show a French `Nord` pacific locomotive and Hornby`s toy version. 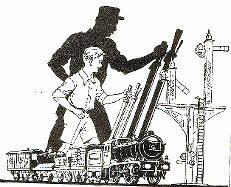 The Hornby omits one driving axle, a common device to enable it to negotiate sharp toy train rail curves, and also to keep the price down! The Hornby however does have smoke deflectors, which the real locomotives were fitted with at a later date. Hornby Princess Elizabeth (1937/1940) and a little Hornby M0. The top and bottom of the range. However this particular M0 is the earliest of its type. Made in 1930/31. Then the design was revised. The Dutch Hornby Association keep a note (see their website) of numbers of Hornby locomotives offered for sale over recent years. Princess Elizabeth number is 69, the prewar red M0 is only 3. That covers an eleven year period. But possibly there were none of the earliest type (such as this one) from the first couple of years. This demonstrates how expensive locos have survived, whilst cheap toys for small boys have not, even though made in vastly greater numbers. Go to top left of this page to click on more pages. Links to other sites are on Page 5. Note - You may have to scroll left to see the links to the other pages of this site.